Royal Gorge Bridge is a must-see if you want to catch the best panoramic views of Colorado. 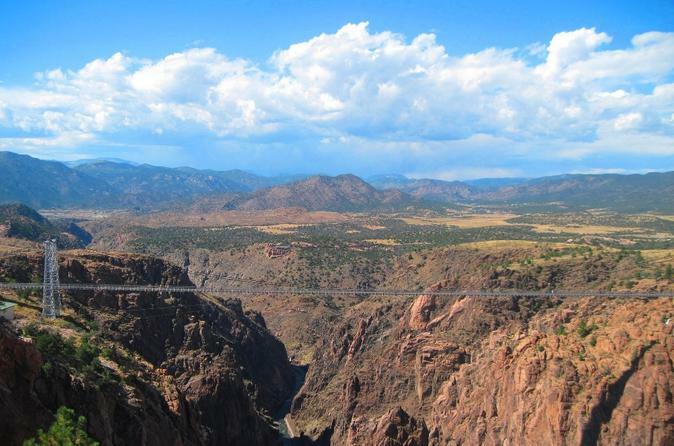 Located in Canon City, the Royal Gorge is one of the highest suspension bridges on earth. Royal Gorge Bridge is a must-see if you want to catch the best panoramic views of Colorado. Located in Canon City, the Royal Gorge is one of the highest suspension bridges on earth and offers splendid photo opportunities and a one-of-a-kind experience. The Bridge is one of the most beloved landmarks in Colorado and it is not difficult to see why. After making your way to the bridge, you will find yourself standing more than 950 feet above the Arkansas River. Views from the bridge are amazing, and at the nearby Visitor Center you can take in the awe-inspiring vista of the beautiful Rocky Mountains or glide 1200 feet above the Canyon on the area's celebrated zip line.